I’m a sound sleeper by any measure. But the loud, insistent sound began to penetrate my dreaming brain. I reached out blindly and slapped my alarm clock. I slapped again. My clock has about 10 buttons on the top. I pushed every single one. Blindly. In my sleep. OK… maybe it was the phone. Not a usual phone sound, true. But I was asleep. The phone seemed a likely candidate. Eyes still closed and brain still basically in dreamland, I reached out, grabbed the phone, hit the answer button and brought the receiver to my ear. Hello? I heard… Dial tone. Not the phone. What the heck was it? I realized that I was going to have to, alas, wake up. I blearily opened my eyes part way and, setting my glasses on my nose, rose to a sitting position. 5:00 AM. What the heck was that noise? AH! I’ve got it! It’s the battery backup on the computer. I must have lost power and it’s telling me. I need to shut the computer down. I sleepwalked towards the back bedroom I use as an office. As I passed the control pad for my burglar/fire alarm on the wall, I noticed that the beep was really loud right there. As I turned the corner into the office, the sound faded a little. OHMYGOD IT WAS THE ALARM! Instantly wide awake, I started at the alarm control. A yellow light labeled, rather unhelpfully I think, TROUBLE was on. Within about 30 seconds, I had every light in the house on. I walked around, looking for something out of place. Everything looked OK. I reset the alarm to turn the beeping off, and looked closer at the control. It didn’t indicate that any zone had been breached. Nor did it indicate a fire. Besides, when a zone is breached, it doesn’t beep. It emits a huge, whooping alarm and yells at the top of its voice, Warning! You have entered a secured area! Leave immediately! Every time I test it or set it off accidentally, I expect to see the robot from Lost In Space (the old TV show, children, not the newer movie) come rolling in: Warning! Danger Will Robinson! What the heck does TROUBLE mean? I’m not really into psychoanalyzing my burglar alarm at 5:00 AM. I got out the owners manual. It informed me that the usual cause of the yellow light was bugs in the fire alarm. Insects, that is. It added, with a note that I’m sure my car mechanic would appreciate, that regular maintenance was the best way to prevent problems. I’ve lived in this house for 10 years. I have to vacuum out my fire alarm? Who knew? I went to bed. The adrenaline rush from the alarm had done its work. Sleep remained elusive. The manual suggested testing the fire alarm and then resetting. In deference to my neighbor’s Saturday morning sleeping, I waited until after 8:00 AM. Testing the alarm requires the following steps: (1) Call the monitoring service and tell them you will be testing and ignore signals sent for the next hour. (2) Balance precariously for what seems like forever on the aforementioned step ladder while holding a teensy little magnet at the exactly correct distance from the exact correct spot on the side of the fire alarm until the alarm responds by first flashing a red light and then reacts by whooping the alarm and yelling Warning! A fire has been detected! Leave the premises immediately! (3) Climb down off the ladder as fast as possible while holding hands over ears and turn off the alarm. I reset the alarm. No lights. Everything was quiet. I breathed a sigh of relief, secure in the knowledge that I had solved a problem quite handily. I went back about my own business. For about five minutes. I called the alarm company. They don’t work on weekends but Scott is really good about answering his pager. He was able to look up the signals from my alarm. The good news is that everything is working OK and I’m still safely protected from both unauthorized entry and fire. Once a week, to make sure it can talk to the outside world and send an alarm to police, fire, etc., the alarm sends a signal to the company and waits for a signal back. If it doesn’t get one, it sends again – about 8 or 10 times. Then it starts beeping and trouble-ing so you know there’s a problem. Why does it always happen at Oh-dark-30? I asked in joking sort of way. We pick a time when you’re not likely to be using the phone. Scott replied helpfully. Ack! This was on purpose! Scott thinks I need a new DSL filter because the alarm could send but didn’t recognize the return ping. He’s sending me a new filter in the mail. If the new filter doesn’t come or doesn’t work, you know what’s going to happen next Saturday at 5:00 AM. This is a little bit of stash enhancement that occurred this week. 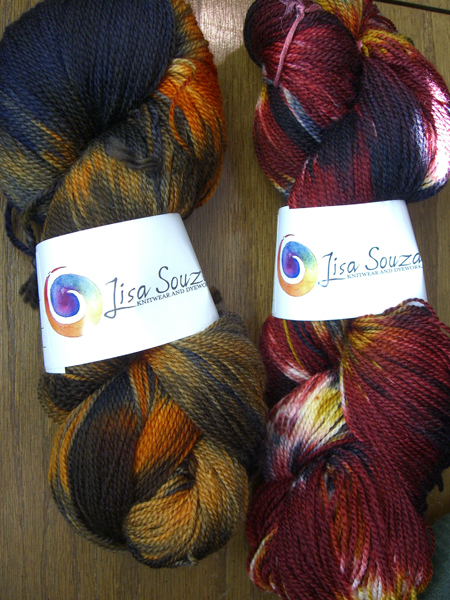 Yarn from Lisa Souza. On the left is Mahogany and on the right is Mars Quake. I know I don’t really, really need any more sock yarn. 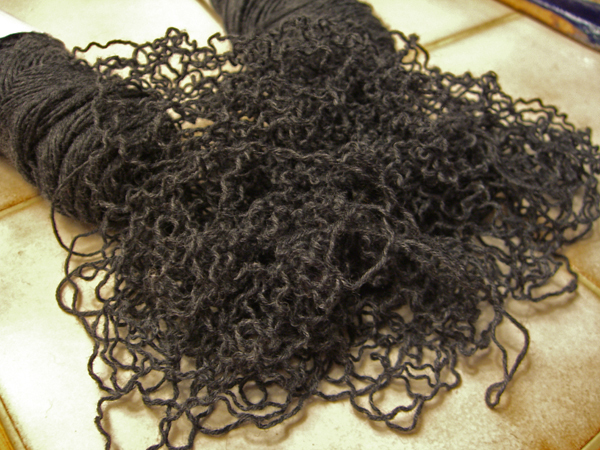 But who can resist yarn called Marks Quake? And the Mahogany is simply to die for. My camera does not do justice to either. And at $16 for a 560-yard skein, this is one of the best hand-dyed yarn bargains on the internets. I was also very impressed with Lisa Souza’s customer service. My order was answered by e-mail very promptly. I paid via pay-pal, and that can sometimes slow the order down. But my payment was acknowledged within minutes! The order was mailed and delivered within days. I will definitely buy from Lisa again. My pocketbook does not find that fortunate. 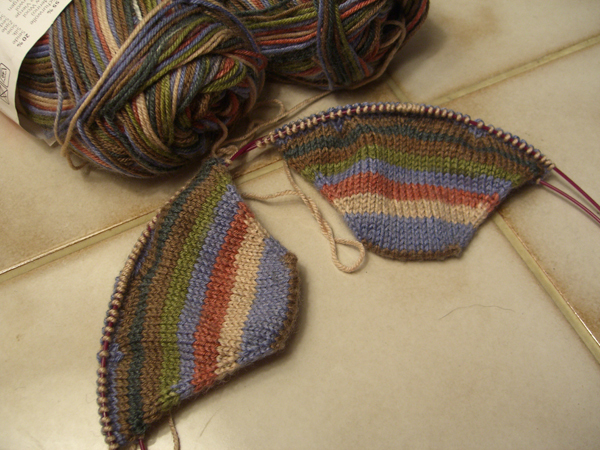 Socktober Socks #2 are coming along. They are stuck right now in the instep black hole, but they do advance slowly. 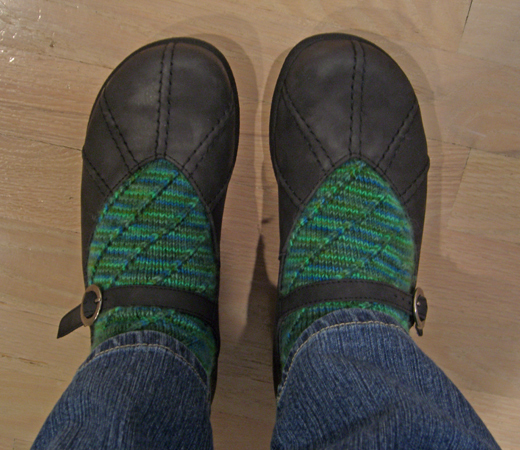 If I can just get some knitting, time, I will get them done!